The function and livelihood of your natural teeth affect much more than just your oral health – they can have ramifications regarding your diet, your speech, your self-confidence, and your overall quality of life as well, which is why losing one or more to gradual wear, significant decay, or traumatic injury can be a devastating experience. Today, dental implants are a state-of-the-art solution to this crucial problem, restoring the natural state of your teeth in a seamless and revitalizing manner. This treatment process is a team effort between your restorative dentist and a trusted oral surgeon like Dr. Firas Katabi or Dr. Emily Smythe. 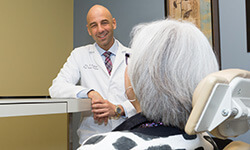 The implant surgery (as well as any tooth extraction and bone grafting procedures) will be handled here at Armitage Oral Surgery in Chicago in a safe and compassionate atmosphere, and the creation and placement of both temporary and permanent prosthesis will be carried out by your dentist. Our team works hard to ensure the highest quality of work and provide the latest technological solutions while keeping patients safe and comfortable. We welcome new smiles from Chicago, IL and other nearby areas. Every placement procedure has a number of variables that will differ from patient to patient, including the number of implants being placed and the patient’s personal needs and schedule. You may be receiving a single implant for a single missing tooth, or you could be in need of a number of implants to support a screw-retained denture or a removable “overdenture.” Whatever the situation is, Dr. Katabi, Dr. Smythe, and the rest of our team will work with you and your dentist closely in order to plan the details of your personalized case, as well as provide the highest levels of precision and accuracy possible. Sedation dentistry and local anesthetic is available to improve your relaxation and help you feel at ease throughout the procedure. Dr. Katabi or Dr. Smythe will carefully insert the implant(s) into the jawbone with special instruments, making a small incision in the gum tissue to do so. 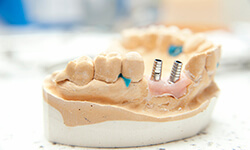 The top of this implant may be visible, or we may cover it with gum tissue to aid the recovery process. Patients will then undergo a period of healing, the length of which will depend on their personal level of oral health and jawbone quality. We will provide all the post-operative care you need and schedule follow-up appointments to gauge your progress and determine when your implants are ready for restoration. During these appointments, the placement of one or more support posts (known as an “abutment”) may be needed. Once the patient’s mouth has properly healed, they will return to their dentist to have the implants restored with lifelike dental crowns, implant-retained dentures, or other custom prosthetics. Why are dental implants the ideal reconstructive solution? 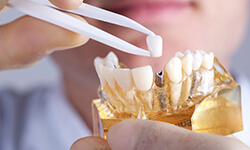 Your natural tooth consists of two equally important parts – the crown and the root. The crown is the white, visible portion that is used to chew your food, and traditional restorative options focus on this section and this section alone. However, the root located beneath the gum line works to stimulate the jawbone, and without it, patients will begin to experience gradual bone deterioration that can have lasting consequences for their oral health and aesthetic appearance. Dental implants seamlessly replicate the entire structure of your natural tooth, and Dr. Katabi and Dr. Smythe are confident in their ability to place your new “roots” with precision and unparalleled success. 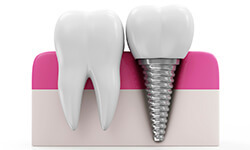 Additionally, dental implants are versatile, functionally beautiful, and durable. Essentially, they create new teeth that are virtually indistinguishable from the natural model. Although the overall cost may be larger, it’s important to remember that dental implants should be seen as a long-term investment that will lead to welcomed convenience, bolstered confidence, and a restored quality of life. Why is it important to have implants placed sooner rather than later? Jawbone deterioration is a serious concern that occurs quickly after patients have lost one or more teeth. In fact, 25% of the supporting structure is typically gone after just the first year. Because replacing this lost bone becomes a more and more complex procedure as time goes on, Dr. Katabi and Dr. Smythe recommend undergoing implant placement as early as possible to simplify your care and ensure healthier, happier results in the long run. Do I have enough bone to support the placement of new dental implants? After the patient has had lower or upper front teeth extracted, where the bone is naturally thin and may need additional support for eventual implant placement. If a patient had one or more teeth removed several years and their bony ridge is now too thin. If the sinus cavities in the upper jaw interfere with the areas that need to bear the implants. When cared for properly with diligent at-home oral hygiene and professional maintenance with your general dentist, dental implants can last for 20 years, 30 years, or even the rest of the patient’s lifetime. Have Questions? For questions regarding current treatment please call the office 24 hours a day, 7 days a week.